PaintCode is a unique vector drawing app that generates Objective-C or Swift code in real time, acting as a bridge between developers and graphic designers. 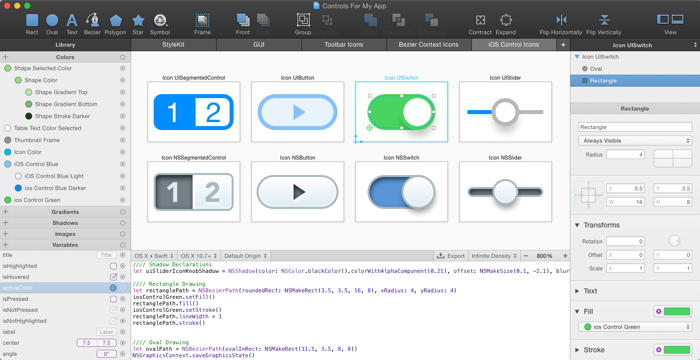 With PaintCode, developers and designers can create an app that is truly resolution-independent, using code (instead of a large number of image assets) to draw a user interface. PaintCode 2.3 adds support for exporting SVG documents. With SVG export, app creators can now easily use their PaintCode designs in native apps as well as on the web. PaintCode 2.3 introduces a completely rebuilt image export module. The new user interface allows designers to easily configure their drawing canvases and re-export them with just two clicks, at any time. The new version also significantly improves compatibility with other drawing apps, adding support for importing PDF, AI and EPS documents. In addition, PaintCode 2.3 supports copy & paste from most other popular drawing apps on Mac. For power users, PaintCode 2.3 boasts a brand new multi-threaded renderer that significantly improves performance in many scenarios. Pricing and Availability: PaintCode 2.3 is available as a free update to existing PaintCode 2 customers. New customers can purchase PaintCode 2.3 on the Mac App Store and PixelCut's own store for $99.99. Further information about PaintCode and the trial version can be found on the product website. San Francisco, California - PixelCut is a software company founded in 2012 by Peter Krajcik and Mike Antonic. PixelCut's first product, PaintCode, is a full-featured vector drawing app that instantly generates Objective-C drawing code. Bridging the gap between programmers and graphic designers, PaintCode has quickly become one of the most popular developer tools on the Mac. Copyright (C) 2015 PixelCut, s.r.o. All rights reserved. Apple, the Apple logo, App Store, Apple Watch, iCloud, Mac OS X and Retina are trademarks of Apple Inc. in the U.S. and/or other countries.